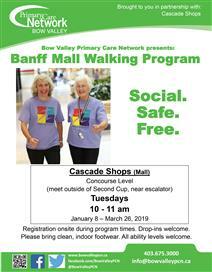 Join other adults in this walking program at Cascade Shops. Meet by the tables in front of Second Cup on the main level. Drop-in. All adults of all abilities welcome. This program is not designed to be family-based, but babies in strollers or carriers are welcome (under 1 year of age). Pedometers will be given to new participants.